A bride stands with her wedding bouquet in the bridal suite at the Wood Norton Hotel in Worcestershire. Laura and David got married and had their reception at the Wood Norton Hotel in Worcestershire. 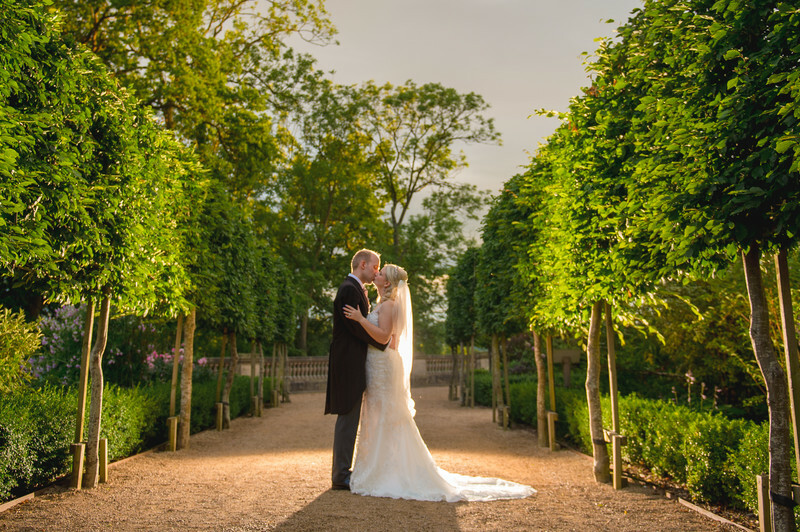 The Wood Norton is a stunning venue, the house itself originally being built for a royal family. The Wood Norton still maintains a level of opulence and majesty. The bridal suite at the Wood Norton is a fantastic setting for photos of brides and bridesmaids getting ready on the morning of a wedding. There's a large stone balcony that overlooks the main lawn of the venue, as well as an expansive living area, bathroom and dressing room. The dressing room is immaculately furnished and clad in a rich wood. This in itself gives the room a lovely warm feel, that's makes the perfect backdrop for wedding photos, especially of brides having their wedding dresses tied by a mother or bridesmaids for example. 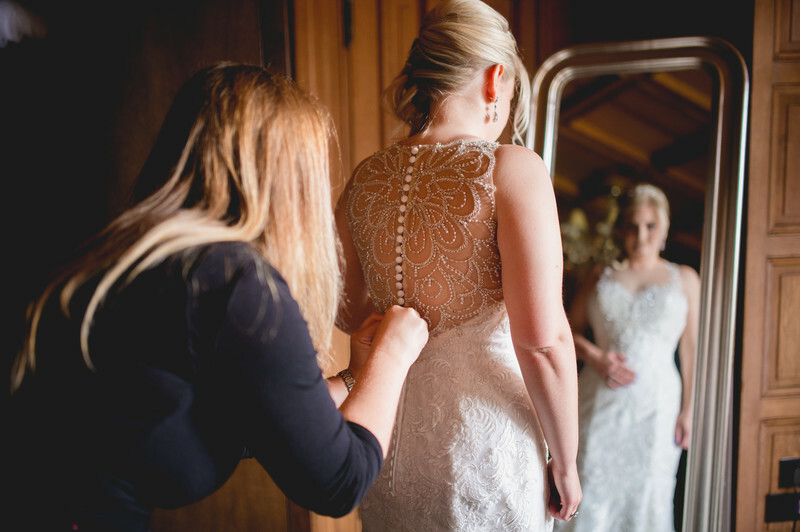 I particularly like this image showing the back of Laura's wedding dress, with the beautiful and delicate detail shown at the back. 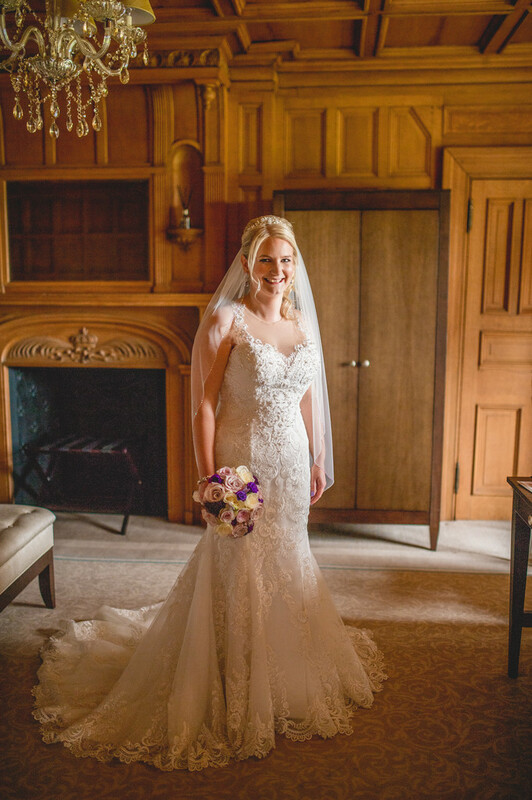 The mirror in the dressing room of the bridal suite is placed perfectly allowing for photos showing both the front and back of a wedding dress at the same time. The warmth in this image can be seen easily, generated from the glow of the room in the summer sun. Later in the day, after the wedding breakfast it started to rain unfortunately. My second wedding photographer and I stayed extra late in order to create the stunning wedding photo that you see above. As soon as we had a break in the rain, we stepped back into the gardens of the Wood Norton to one of my favourite locations. The majority of the light that you can see here is from a flashgun that I had placed behind the couple, in order to light not only the bride and groom but the trees too.